Original Score Composed and Produced By Martin O'Donnell and Michael Salvatori. Album Produced by Nile Rodgers. Executive Producer Sandy Ting. The Long Awaited Halo 2 Volume Two!! Why wasn't this on the fist album? Compared to its first volume, one could say that the second part should have sufficed the fan's demand for the actual game soundtrack. Again, many of the musical pieces are somehow arranged---prolonged additions or changed in style--which was almost unlike from its first release. Whenever I tell my friends about how interested I am in the Halo and Halo 2 music, they usually laugh. But the score of Halo and Halo 2 is amazing and just another reason why the Halo games were that good, in my opinion. Marty O'Donnell and Michael Salvatori are a fantastic team and have never dissapointed thus far. To this day I own the Halo 1 soundtrack, and both Volumes of Halo 2 and I could honestly say that after listening to Volume 2, it's my favorite one yet. The strings, the drums, the horns, everything is put together so perfect. Most of the tracks are very soothing while the rest make your remember the action scenes in the game. I'd reccommend this soundtrack to anyone, even those not interested in the game. While the game owners will arguably enjoy it more, those who know nothing of Halo will still really like this soundtrack, that is if they appreciate good music. Favorite Track: Delta Halo Suite--Just awesome. Especially awesome midway through the song. Here we are at Halo 2 Volume 2 OST. This one is more layered like Halo 1's CD with all of the games music arranged into a CD. 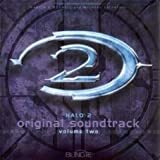 Although I liked Halo 2 Vol 1, volume 2 is where the true compositional talent of Marty O'Donnell shines through. With over an hour of specatacular orhcestral music, volume 2 whisks you through the epic adventures and revelation that is Halo. Best soundtrack yet. Marty is a genius! I LOVE THIS EVEN MORE THAN THE FIRST!!!!!!!!!!!!!! This is the soundtrack that should originally been released versus the version 1 that was riddled with Hoobastank and Breaking Benjamin. Listening to this soundtrack brings you through the game in a cohesive manner in which you will remember all the levels and moments that made Halo 2. From the prologue when you booted up your Halo 2 disc for the first time to the epilogue when you were still gripping your controller in triumph (or devastation over the cliff-hanger) this soundtrack is the real deal. As a seven year drummer, I really loved the percussion pieces. They consisted mostly of military style snares and at other times, very African culture-esque toms. Also, I enjoyed how all the pieces were from the game unlike the first volume's. Sure Incubus is a great band and their drummer beyond outstanding, but I thought their style of music deviated from the Halo universe. Like the description states, Halo 2 Volume 2 uses a suite structure for the music. In this aspect, I find the music very pleasing throughout. I find it rather enjoyable for the most part, but it's my opinion, Marty O'Donnel could have created better transitions between some of the pieces. One thing I do have to say. Some of the music, such as the horns from Prologue for example, carry over onto other tracks. While it gives the album as a whole a better sense of cohesiveness, sometimes I think, "I just heard this!" I'm a fan of the Halo games foremost, but I'm also a fan of the music. I've waited for much of this music to come out since I've played the game and was dismayed to find Volume 1 didn't contain certain pieces, such as Epilogue. Beautiful string-work there. Mombasa Suite is another piece I very much enjoy. If you've seen the E3 demo (now included in Halo: Combat Evolved, under Demos, I believe), you'll notice the first set was used in that. It also includes the percussion used in 'Ghosts of Reach' from Volume 1.